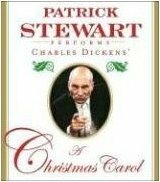 If you only listen to one audiobook this holiday season, I highly recommend Patrick Stewart narrating Charles Dickens’ ‘A Christmas Carol’. Audible have it as an MP3 download, or you can purchase the CDs for higher quality audio. We drove for several hours this past couple of days for Christmas visits and listened to Stewart’s mesmerizing rendition in the car as we travelled. His rich Shakespearean voice characterisations are a treat and, as he leads you through Ebenezer Scrooge’s ‘dark night of the soul’, you can’t help but feel the power of Dickens’ narrative genius and identify with Scrooge’s need for redemption. Having read many wonderful stories to my children over the years, I envy Patrick Stewart’s great talent. ~ by Garry on December 25, 2011.